U.S. carter's is having a great Presidents' Day Sale going on right now. More you spend, more you save! Get an extra 25% discount on your purchase of $50 or more. Or, get an extra 15% discount on your entire purchase, without any limit for spending. To receive the offer print the coupon and show it to the cashier during the time of your purchase. Source of the information is U.S. carter's. Offer is valid until February 20, 2017. 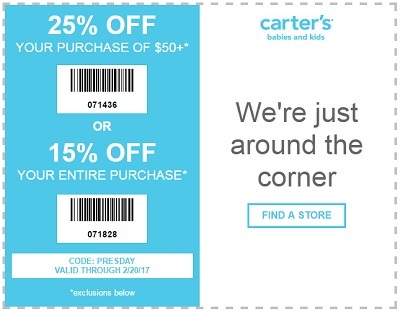 More details available at any U.S. carter's store locatio in the U.S. or U.S. carter's online.